PlayStation 4 version tested. Review copy provided by publisher. By all accounts, the Tales series is possibly the most progressive and inventive among JRPGs. When Tales of Phantasia debuted on the SNES, its use of voice clips and real-time action combat was unheard of, especially within the JRPG space. It really was almost like a fighting game combat system was placed in a JRPG shell and it worked marvelously. Fast forward to the present day and the Tales series isn’t doing much to reinvent itself anymore, instead sticking to tried and true styles of gameplay and level design. The big question is, is Tales of Zestiria, the latest in the series and first to hit PS4, a fantastic JRPG, or just an anime-themed cash grab? It’s not the latter, I can tell you for sure, but likewise it’s hardly a JRPG masterpiece, either. After hours and hours of play I have to say that Zestiria is an experience which I’m still not sold on, despite the fact that I totally intend to play more and more of it. The pretense is that you play as Sorey, a ruin fanatic who happens to live in a village of Seraphim, also referred to as Seraph, a race of human-like spirits who command elemental powers and go about the world entirely invisible to normal humans. Sorey was raised with them and has a high “resonance”, which basically means he can see them while other people can’t. It’s not long before Sorey’s casual day-to-day life gets rudely interrupted and he’s forced to leave his humble, peaceful village of spirits with his best friend Mikleo. Tales games have a habit of going straight to cliché openings. The main character is always mildly special for some reason, they have amnesia or something similar. To continue this cliché, you’ll find that a girl Sorey becomes fond of early on is a Princess. The story pretty much continues on this path of predictability. There are four “Trials” for Sorey to complete in order to make him stronger, there are pals to meet who are lifted straight from the book of anime archetypes (moody character, dipsy character, someone with a deep secret in their past, etc.) and there is a big bad guy with a big evil name to beat the crap out of – the Lord of Calamity. Seriously, that’s his name, about as subtle as naming him Lucifer, King of Hell. It’s strange because whereas so many Tales games I’ve played in the past have given me reasons to fear and revere the big enemies, the Lord of Calamity’s story is a bit of a wet fart which can be surmised as “He lost everything so he’s going to take everything else away.” This wouldn’t be so bad if there wasn’t genuinely a sizeable section of the game dedicated to discovering what actually made him into such a bad guy. 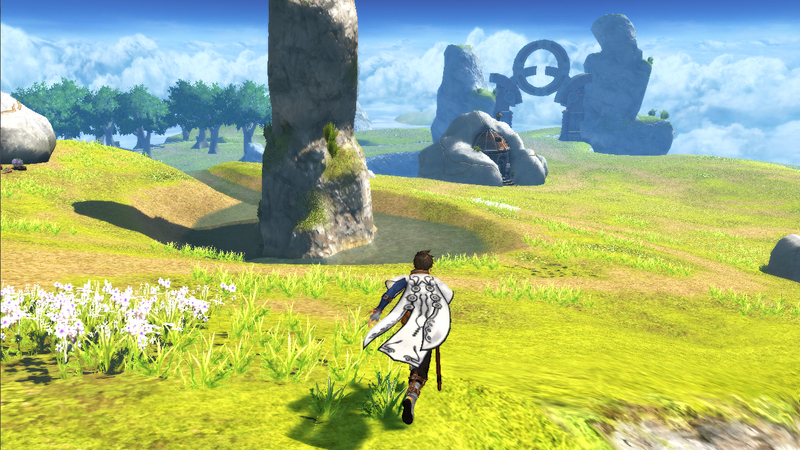 But of course, Tales of Zestiria has some beautiful moments too, particularly during combat. Early on combat is overly easy, amounting to you only having to press the Circle button over and over until you win. It takes hours and hours of gameplay before encounters start getting interesting, but eventually you’ll be meeting with enemies able to take your entire health bar in a single swipe. Armatization comes into play here – a fusion of sorts which combines your health bar and abilities with that of one of your Seraph partners. Since the Seraph have elemental abilities, this gives you advantages such as a giant flaming sword, or a bow which shoots water energy. Armatization seems overpowered at first since it’s easy to activate over and over, but in reality, some enemies will actually become tougher to beat once Armatized, and vice versa. It takes a long while for the advantages of fighting solo versus fighting fused to come to light, but once the game picks up the pace you’ll understand how to get through these challenges. 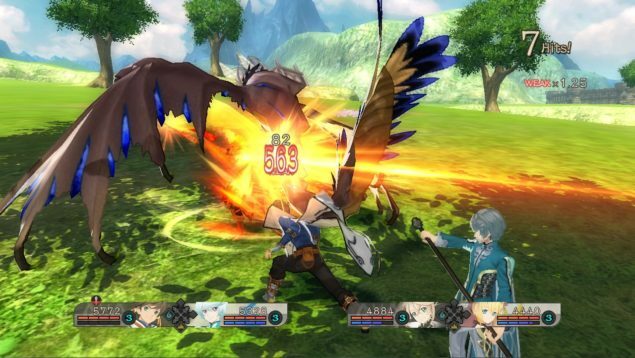 Tales of Zestiria’s combat system takes cues from both Tales of Xillia and Tales of Graces F, eschewing the Tales traditional TP bar (a magic bar of sorts which limits use of stronger “Arte” attack) and instead gives you a longer, easily refillable gauge which recovers whilst guarding and dodging attacks, much like Tales of Graces F. This means that instead of using all of your TP and struggling without it for a few battles, five seconds stood defending will give you all the power you need to begin comboing with every move you have. In the past you’d save your best moves for opportune moments, but now your best moves can come out every battle. As mentioned, the easy difficulty of early battles means you likely won’t embrace this for a while, but once difficulty ramps up mastery of the battle system is a must. And yeah, it’s actually fantastic once you get into it. The battle system literally made playing Tales of Zestiria worth it for me. The story has a pace which either shoots like a bullet or plods through quicksand, and at neither moment did the plot give me either a massive thrill or a bore-filled yawn. It was just there, driving me to the next battle encounter. Despite them being typical archetypes, the characters in your party become loveable pretty fast. Walking through the large world with them causes them to chat to one another, and the Tales staple skits (dialogue conversations triggered by story or location) are still fun to watch, giving you insight to the motivations and personalities of the characters. I really do have a soft spot for a few members of my party, whilst other members I could still care less about. One thing that stuck out to myself and whoever was lucky enough to watch me play was the musical score that’s throughout Tales of Zestiria. Sometimes it was genuinely jarring, I’d enter a boring, grey ruin, and suddenly an amazing jazzy orchestral tune would start playing and I would adore it. Whether walking across the large open plains of the world or spelunking in the dungeons, the soundtrack remains a constant highlight. In terms of graphics and performance, Tales of Zestiria on PS4, unlike the PS3 version I previewed, has smooth and greatly decreased pop-in issues. Some areas are still very plain, though, clearly showing its PS3 origins, while other areas have strikingly beautiful backgrounds. If there’s one thing I want to finish on, it’s that I really, really like Tales of Zestiria, I just don’t love it. The battle system feels like the best it’s been in years, but the story is one of the weakest I’ve seen in a while and there are plenty of minor niggles that prevented me from loving it. Despite all this, it’s a game that is at times gorgeous, and is constantly intriguing. I like the battle system enough to go back after my first playthrough and defeat all the hidden and optional bosses, and that is praise indeed.